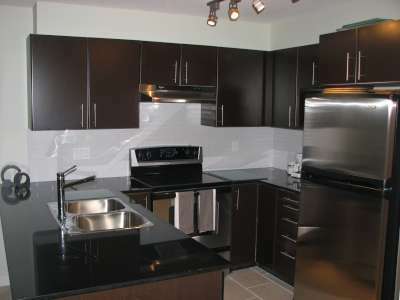 Touchstone is a bright, new, 2 bedroom, 2 bath and fully furnished condominium in North Vancouver. 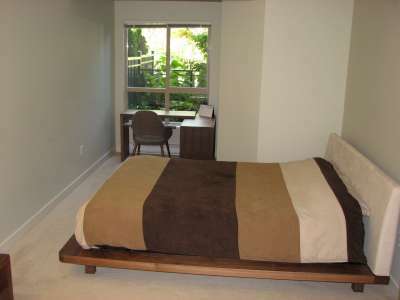 This condo features secured parking and fast, easy access to all Olympic venues! 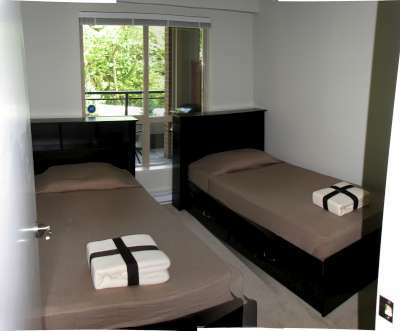 There are flexible sleeping arrangements for 4 persons, comfortably, and a 5th person is also possible providing one is comfortable on a large chaise lounge/sofa or a single cot. 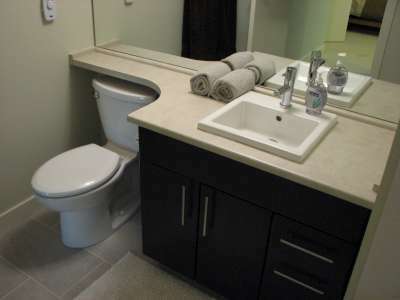 Included is a fully equipped kitchen with stainless steel appliances, in-suite laundry, television in each room, wireless internet, alarm system, fireplace, microwave,bed and bath linens, one secure assigned parking stall, with additional secured guest parking and an extra storage locker for skis, boots, boards, wet snow gear and the like. Being wheelchair accessible is a nice feature as there are no stairs to contend with. 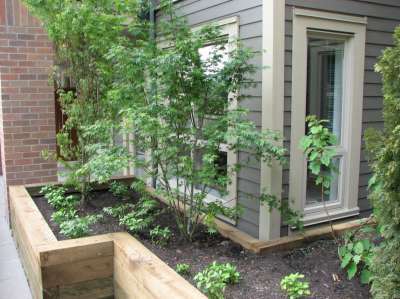 This suite is in a quiet building with a private, above-ground, covered patio that overlooks forested Mackay Park and Creek, and is within walking distance of Mosquito Creek park and trail. 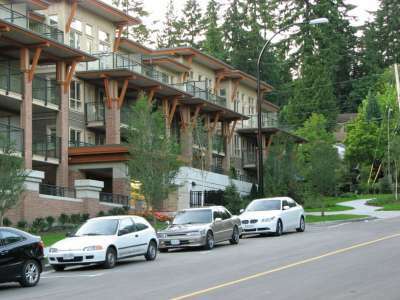 Just steps to transport and amenities such as Vancouver Transit Bus stops, Starbucks, Shopping Mall, Pubs, Restaurants, Liquor Store and Medical Clinic. 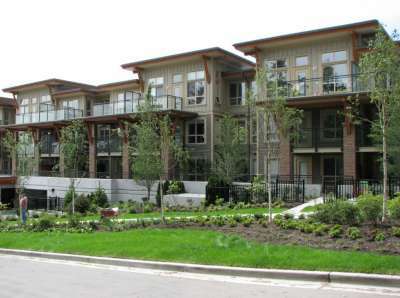 Located 10 minutes from Downtown where you will find the Hockey, Curling, Figure Skating events as well as Stanley Park and all it's attractions. In addition, all 3 local mountains -Cypress, Grouse, and Seymour are all a short drive away. A short 5 minute drive will take you to the highway entrance leading to the Sea-to-Sky highway and onto Whistler for the Official Alpine Skiing events. Lonsdale Quay is also a short5 minutes drive away where you will find access both the shuttle service to Cypress Mountain for the official freestyle skiing and snowboarding venue, or to the Seabus for faster service to Downtown. Enjoy the convenience of sightseeing at your fingertips... Located just a 5minutes drive away is Grouse Mountains Gondola, Bear Sanctuary and to the Capilano Suspension Bridge and Fish Hatchery. Your experience awaits! Double Chez Lounge in the living room can sleep one. We enjoyed our stay at the Touch Stone apartment. It was beautifully presented, modern and quiet. 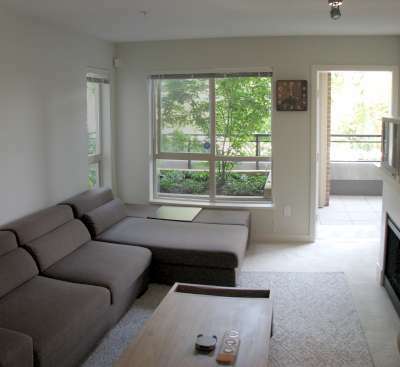 It was in a perfect location, easily accessible to all the transport facilities we needed for the Olympics and for just getting around Vancouver. A shopping centre close by and one a short bus ride away catered to most of our needs. The local restaurants were very nice to eat at and the food was excellent, their pricing was very reasonable. Chris & Sharon, our hosts, was very helpful in all ways. They were very friendly and easy to communicate with. They made sure our stay was everything we could want even to the smallest detail of putting in fresh milk for our coffee. We were extremely happy with them. 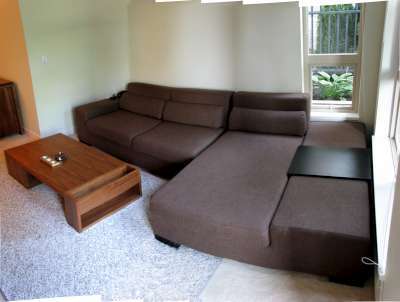 We would recommend the apartment to anyone looking for a lovely area of Vancouver to stay. EMR were very helpful in locating accommodation for the Olympics. 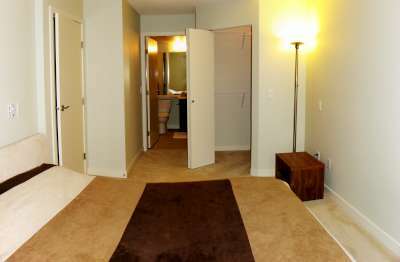 You were very explicit with all the details we needed to acquire the accommodation. The arrangements were made as easy as possible for us including payment. Although handing over such a large sum of money was very scary from the other side of the world.